The Concept Z low-profile baitcasting reel is the latest product from new kid on the block 13 Fishing. The tackle company with the unique name has certainly created a lot of noise in sport fishing circles with the launch of its equally unique (and visually striking!) orange-colored baitcaster. The small, up and coming Florida-based tackle company, that started out just a few short years ago with its focus on the Australian market, claims the Concept Z is a revolutionary design that will forever change the fishing game. But is there any truth to the hype? What does the Concept Z baitcasting reel bring to the table that has so many seasoned anglers talking about it? We’re going to take a closer look at this bold new baitcaster in this review to find out what all the buzz is about. CZB (Concept Zero Bearings) technology eliminates ball bearing failure – an industry first! Let’s start by taking a quick overview of the reel. 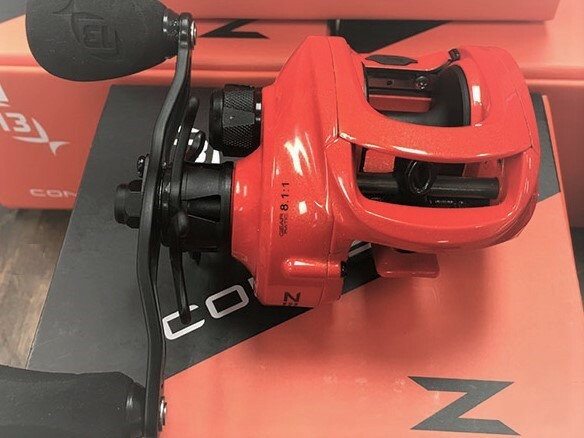 The low-profile Concept Z is the newest addition to the company’s “Concept” baitcasting reel series that began back in 2014 and includes the popular 13 Fishing Concept A and Concept C reels. The Z was designed with inshore saltwater fishing in mind, though it also feels right at home in freshwater. It comes with an industry standard One-Year Warranty, though that may become a moot point if this reel functions as well as advertised. Before getting to the meat of this reel features and performance, let’s quickly address something that gets brought a lot about this reel – the choice of color. Yes, it’s bright orange and I’m sure that, at least from a marketing perspective, 13 Fishing probably thought it would make it visually easier set it apart from the competition. Well, they sure have succeeded on that front! But I think this new Concept baitcaster has already set itself apart from others on the strength of its unique and cutting-edge solution to an age-old fishing reel problem (more on that shortly). Anyway, perhaps, they will introduce some more colors in the near future. But even so, the 13 Fishing Concept Z, cosmetics aside, is still a very unique, one of a kind reel. Internally, the Concept Z’s components are protected from saltwater corrosion with the same Ocean Armor process used in other 13 Fishing Concept reels. The reel’s sideplate uses a unique Beetle Wing design keeps the sideplate attached while allowing you to rotate it out of the way to expose the internals. If you’ve ever dropped or misplaced a sideplate while adjusting the brake controls or performing maintenance you’ll appreciate this feature (not that you’ll be doing much maintenance with this reel). Other key features include a black aluminum handle with EVA knobs, precision-cut Japanese Hamai hardened brass gears, 13 Fishing’s Dead Stop Anti-Reverse system, and an exterior cast control knob with click fine tuning. The Concept Z baitcasting reel is versatile enough to fish any type of line including braids and fluorocarbons as well as light and heavy lures. It is a great baitcaster for bass fishing. Though the Z is loaded with innovative features, the most unique and promising feature of this reel is, unquestionably, its CZB technology. Let’s see what this is and why it’s a big deal. CZB – A Revolutionary Concept? Straight off the bat, let’s dig into the main feature that has created so much buzz for the Concept Z – it’s Concept Zero Bearing (CZB) technology. Basically, the Concept Z has no ball bearings whatsoever. You read that right – no ball bearings! This may seem like a wild concept, but there is plenty of science to back up the CBZ technology. Produced by a proprietary polymer that 13 Fishing modestly refers to as ‘Space Age’, this material, which is more of a type of bushing, is designed as a high-tech replacement for traditional ball bearings in the reel. As a result, the Concept Z eliminates one of the most common and frustrating issues facing baitcast reels, and just about any other type of reel – bearing failure. Most saltwater reels, baitcasters included, are subjected to varying degrees of environmental abuse – water sprays, the occasional dunk in the water, dirt and grit intrusion and so on. There’s no getting around it, that’s just the nature of saltwater fishing – of fishing in general. Add to that the fact that it’s easy to get complacent with reel maintenance, especially after the first year or two of ownership. We stop performing regular reel maintenance – assuming we even started. However, even the slightest corrosion or wear issues with a baitcaster’s ball bearings can quickly snowball into a serious problem. But unlike other baitcasting reels, the Concept Z’s performance should not be affected by debris or corrosion because there are no bearings to get dirty or be corroded – the reel’s design basically eliminates any type of internal wear and tear. That means the reel performance remains at the same level it is today in a year, two years and beyond. Bearing degradation over time, a common problem with even the best of traditional baitcasters is pretty much a non-issue with the Z. Without ball bearings, you are eliminating one of the biggest causes of reel breakdowns. This reel should remain very smooth to operate, with all-around great performance for a longer time than the average baitcast reel. In short, if you do a good deal of inshore saltwater fishing and/or have neither the time nor the inclination for routine maintenance, you might just consider the Z’s Zero Ball Bearings (CZB) Technology to be a truly revolutionary concept. Along with the positive buzz, the Concept Z has also garnered some skepticism. Since its release, there have been some polarizing opinions with regards to its casting performance. For some, it’s nothing more than an average baitcast performer, while others are calling it the best casting baitcaster on the market. So which is it? As is often the case, the truth tends to lie somewhere in the middle. The reel’s casting capability, in my opinion, is very impressive – in large part due to the reel’s zero bearings construction. It’s easy enough to get off smooth, long casts with little effort with the Z. You will most likely find that you can get an additional 10 to 15 feet of distance over many competing reels with the Concept Z. Even switching between lures has little effect on the consistency of its casts. However, keep in mind that because of its unique bearingless design, it may take some getting used to at first when casting for accuracy. However, because casting for distance is not an issue with this reel, it will allow for more focus on your accuracy, letting you place your lure or bait effortlessly where you want it. The retrieval on the Concept Z is truly something worth getting excited about. Because of the absence of ball bearings, the retrieval is one of the most consistent aspects of the reel, with the same smooth feeling each and every time. It might feel different initially, but once you get used to it, the reel begins to show its true potential. Let me address the topic of noise, as it is perhaps one of the most hotly debated points regarding the Concept Z. While most anglers find the reel to be smooth and quiet, some others have reported a surprising amount of noise (notably a whizzing or whirring sound) when casting or even retrieving. But I believe that a lot of the complaints about noise have more to do with the fact that this reel doesn’t sound like your traditional baitcasters due to its lack of bearings. All reels make some type of noise on cast and retrieval, none are 100% silent. In fact, when compared to the noise produced by other reels, the difference in levels is pretty much comparable. I think that as anglers get used to this different type of noise this will become less of an issue. Also, some have noted a lessening of the noise with time, so it could very well be that this is something that could naturally go away after a breaking in period. Furthermore, adjusting the Concept Z requires a slightly different approach, which may contribute to noise. The spin is so consistent with the reel that the cast-control brake settings don’t need to be as high as with other baitcasting reels. You may find a lower setting of 1 or 2 to be optimal, with near silent casts as a bonus. The Concept Z comes with a lot of hype as we’ve already stated, and for the most part, it delivers on all fronts. I do hope, however, they bring out some other colors for those of us who prefer a more traditional look over the Z’s current and lone bright orange option. But at its core, this is an intriguing reel with its revolutionary zero bearings concept. For anglers who want a baitcaster that will stand up to the challenges of saltwater fishing year after year with minimal maintenance, the Concept Z looks like a winner. The use of special polymer bushings in place of metal ball bearings (CZB) is an ingenious approach by 13 Fishing. It not only makes casting and retrieving smooth and consistent but, more importantly, eliminates one of the most common challenges for anglers today, namely reel failure due to worn or corroded bearings. As a result, the Concept Z is a baitcasting reel that will perform as good as the day you got it for many years to come. There is a chance of some noise when casting, but this is much the same as any other reel and tends to become less apparent the more you use the reel. In conclusion, the oddly named tackle company whose motto is “make your own luck” has come up with a radically different baitcasting reel that may very well change how fishing reels are made in the future. The Concept Z is not perfect, and I don’t claim it to be the best baitcasting reel around today, but by eliminating bearing corrosion and failure, it may be the perfect solution to a timeworn problem faced by so many anglers. This entry was posted in Tackle/Gear Reviews & Guides on April 2, 2018 by Dorado. Who cares about the color. 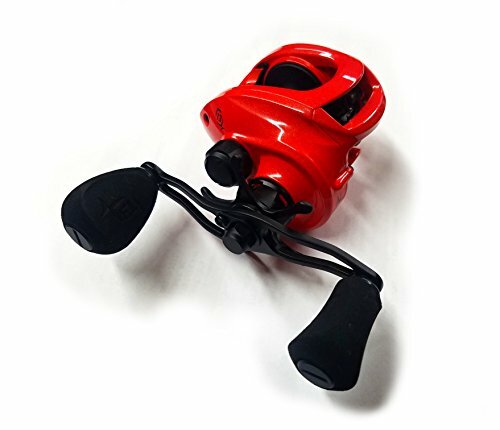 Is it a good reel, is it resistant to salt water? Sounds like it.